December 3, 2014. 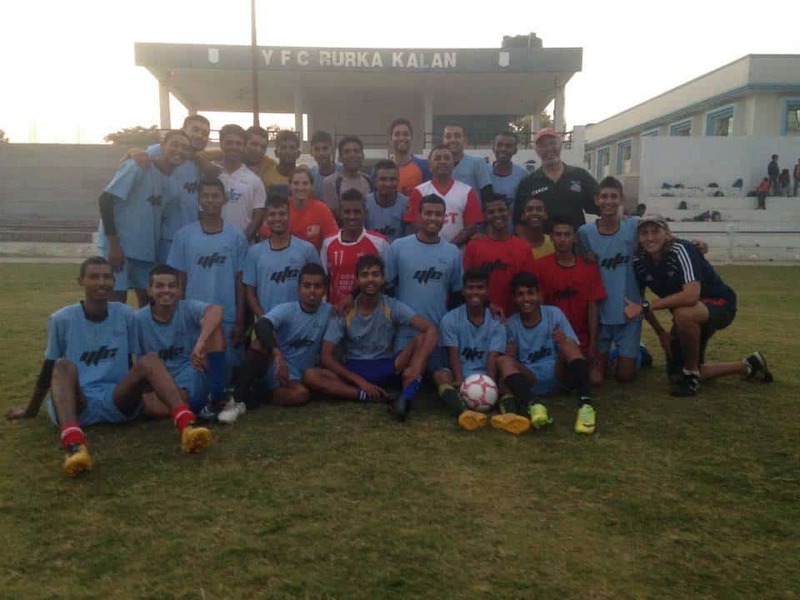 Volunteer Coach Billy Hawkey tells us about his time with CAC On-Field in Punjab, India working with YFC Rurka Kalan. Billy first joined us in October for two weeks in Lima working with Unicef Peru. After two weeks in Delhi, arriving in Punjab was literally a breath of fresh air. Vast fields of potatoes, corn, wheat, sugar cane, kinnos groves, and farms in all directions. Shining stars and cool, crisp nights, the agriculturally rich state of Punjab provided a stark contrast to the country’s buzzing and beeping capital. When we arrived at the YFC Rurka Kalan headquarters we were taken out to walk the field and get a lay of the land for where we would be for the week. The stadium was pristine, and the well kept natural grass pitch was flat, wide, and green. We all sensed that it was going to be a good week. After walking the field we met inside the office with Prateek, a member of YFC, over a cup of chai to discuss the expectations and goals for the week, as well as familiarize ourselves with the local social issues. The main problems that were identified were substance abuse and gender equality (or lack there of). We assured Prateek that these issues would be addressed during the week with various games from our curriculum. We learned that 60% of Punjab’s youth are believed to be using medical or synthetic drugs and that 1 in 3 households in Punjab have a drug addict living in their home. It is easy for Punjabi children to succumb to drug and alcohol abuse simply because they have nothing else to do. That is why at YFC, the players have structured training 320 of the 365 days of the year. Gender equality is also a major issue in Punjab. Girls are confined by tradition which views sport as a male hobby. Society’s dominant stance on women in the community is that they belong in the home. For this weeks’ training we were going to be working with a group of predominantly young female leaders in the morning from 9-1, and a boys team in the afternoon from 2-6. One of the reasons for this was because from 2-6, women in Punjab are supposed to be in the home working. Our days began with a half mile walk to the YFC center from our guest house down the road. We had breakfast at8:00 a.m. in the YFC kitchen. Breakfast consisted of omelets, bananas, cereal with hot milk, juice, toast, stuffed chapatti, and of course, chai. Chai is like water in India; at the end of a game during the week, kneeling over at the knees and out of breath, a man exclaimed “I need, chai!”. The kitchen always smelled amazing. Hot chapatti being turned out every minute, and local organic vegetables being seasoned and prepared the Punjabi way. YFC has a residential facility that houses an elite u-14 boys team comprised of high level players from all over India. The boys live here for several years training and attending school which overlooks the main field. At 9:00 a.m. we began classroom sessions with our first group, approximately 40 individuals, 30 of whom were females. These sessions included “What makes a good coach?”, review of the games that we played from the previous day, group presentations, and a child rights discussion/training. By 10:00 a.m. we were on the field ready to play. On the first day the majority of women arrived in their saris and sandals. Despite the fact that we suggested they wear athletic clothes, the group was comfortable in their outfits and continued to sport their colorful silks for the rest of the week (but with a few more sneakers). The group was new to futbol, but eager to learn. An older woman revealed that this was the first time she’d ever played a sport. Being 50 years old, she explained that old tradition had kept her away from sports, and that her parents and society saw no value in it, especially for girls; an idea that is still held by many in India. However she was ready to break away from the restrictions of traditional society, and proved to be a symbol of change and courage for everyone. Her story sparked an applause from the group; and she demonstrated first hand a core belief of CAC, that is to challenge and question tradition. At this point Community Impact Coach, Guru, asked the group to look around and notice something. All of the women were standing shoulder to shoulder in the front, and all the men were standing together in the back. “That’s old Punjab” Guru exclaimed, “we want New Punjab”, and with a slight hesitation, the group intermixed the genders. Boys and girls don’t play sports together in Punjab. At least until now. A game that brought this message to life was Marta for Gender Equity. In this game two teams play a game of futbol to goals. However, one team plays with all of their players and the other team plays with only half. This creates an 8v4 situation. The four players sitting out represent women and their team represents only the men participating in society. The other team with all eight players represents a cohesive community in which both men and women are utilized. After about 10 minutes we brought the group together to discuss. The excluded players said it wasn’t fun or fair to have to sit and watch. It was noticed how much better the full team did in this game, just as a society functioning with all of its resources similarly is more successful. Teams reversed roles so the other group could experience how it feels to be excluded from participating in sports. Finally, the third progression starts with both teams playing 4v4. When a team scores a goal they get to bring another player on; representing empowering a female to play. This must be done by verbally communicating an empowering message to the women on the sidelines. The energy and excitement on the faces of the players, especially the men, when they had the chance to bring on a female, was amazing. 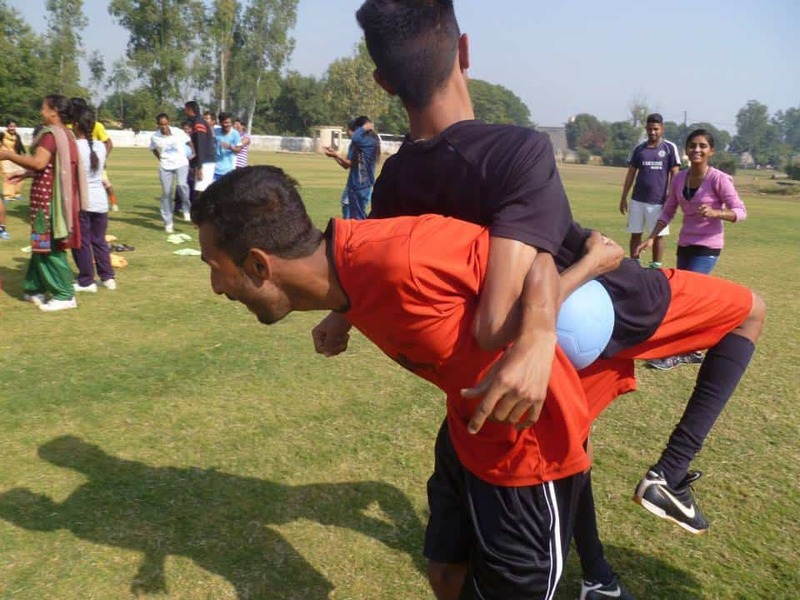 I watched a man sprint to the sideline with a huge smile on his face, screaming in Punjabi and lift a woman to her feet to play. This was not just a product of the competitiveness of the game; these powerful sentiments for equal opportunity for women in sport was expressed genuinely and proudly by the men in the discussions. It was acknowledged that if women had the same opportunities to train and develop starting at the same age as men, then they would be just as skillful. YFC is hoping to achieve this by training their female youth leaders and starting women’s teams this season. At the end of a midweek session we drank more chai, sang and danced on the field and a small talent show was conducted as well. Definitely a new way of cooling down. After a delicious lunch, we switched gears and began our afternoon session with the YFC boys team. These boys, all dressed in their light blue training kits, were ready to play. The pace was quicker with the afternoon group; the ball zipped around the field in one and two touch, and players were sliding into their tackles. An impactful day was our Gazza day, with four games centered around substance abuse. Discussion questions included why people engage in anti-social behaviors, the effects of abuse on the individual and the community, safe spaces, support systems, and good decisions. One game in particular that held a strong impact was Gazza scrimmage. Two teams play a scrimmage to goals, one tem must walk at all times and the other team has no limitations. The walking team represents alcohol/drug addicts, who have clearly had their athletic abilities hindered by sustained substance abuse. This game followed Gazza dizzy tag, in which taggers must first spin around 10 times (or 20 if Guru is leading) before chasing players, exhibiting the immediate effects of intoxication. Gazza scrimmage shifts the message to an addiction and the effects it has on your life over time, and the effect it has on the community. The walking team got smacked, and the game bridged a discussion of alcohol and substance abuse and how it’s bad for relationships, school, functioning in society, and sports. It was clear by the discussion that these boys have chosen futbol as an alternative to drugs and alcohol. The two groups we had this week were unique and equally enjoyable. The week flew by and both groups understood the objective of the training as evidence of the coach back sessions on the final day in which participants are put in small groups and have the opportunity to lead games on their own that we did over the course of the week, adapt them how they would like, and even invent new games if they please. The coaches demonstrated confidence in their coaching and incorporated the social messages fluently. Until this training, YFC had focused mainly on player development in their sessions, without integrating social messages in games. But they are ready for change. They are ready for New Punjab. Side note: In the nights I played with people from town under the lights on the YFC pitch. Guru and I combined for a few nice goals. On our day off we traveled to the Golden Temple in Amritsar, and visited the India/Pakistan border for a closing ceremony between the two country’s army officials. Great report of your week! Such an amazing experience!